Israeli forces continued to directly target peaceful protests along the Gaza Strip borders without pose any threat to the Israeli soldiers’ life. 14 Palestinian civilians, including a child, were killed, and 1142 others, including 218 children and 40 women, were wounded. 26 Palestinian civilians, including 2 children, were wounded in the West Bank. Israeli forces conducted 48 incursions into Palestinian communities in the West Bank and 8 similar ones in Jerusalem. 64 civilians, including 15 children, were arrested. Thirty-three of them, including 10 children, were arrested in Jerusalem. Israeli forces continued to open fire at the border areas in the Gaza Strip. A Palestinian farmer was killed and another one sustained wounds, east of Khan Yunis. Israeli settlers continued their attacks against Palestinian civilians’ property during the Jewish Holidays. 4 Shooting incidents were reported against the Palestinian fishing boats in the Gaza Sea, but no casualties were reported. Israeli forces turned the West Bank into cantons and continued to impose the illegal closure on the Gaza Strip for the 11th consecutive year. Dozens of temporary checkpoints were established in the West Bank and others were re-established to obstruct the movement of Palestinian civilians. Israeli forces Imposed a complete closure on the oPt due to the Jewish Passover Holiday. Israeli forces arrested 10 Palestinian civilians, including 2 children, at the military checkpoints in the West Bank. Israeli violations of international law and international humanitarian law in the oPt continued during the reporting period (29 March- 04 April 2018). Israeli forces used excessive lethal force against Palestinian civilians, who participated in peaceful demonstrations organized on the 42nd anniversary of the Earth Day in the Gaza Strip. This day witnessed organizing peaceful demonstrations along the Gaza Strip eastern borders, where ten thousands of Palestinian young men, women, children, and elderlies participated in those demonstrations. On 30 March 2018, the Gaza Strip witnessed the bloodiest day after 2014 offensive on the Gaza Strip, as 13 Palestinian civilians, including a child, were killed on the same day, while 1067 others, including 208 children and 40 women, sustained wounds, which were mostly classified as serious. The protesters’ activities continued during this week and the Israeli forces continued to daily target them along the Gaza Strip borders. During the reporting period, the number of the killed persons amounted to 15, including a child, while the number of the wounded persons amounted to 1143, including 218 children and 40 women, in the Gaza Strip. In the West Bank, Israeli forces wounded 26 Palestinian civilians, including 2 children. This high number of casualties in the Gaza Strip, prove that Israeli forces continue their systematic crimes and indiscriminate use of excessive force against Palestinian civilians in disregard for their lives. PCHR indicates that the Israeli forces, by its spokesperson, Avijaa Adraei, sent threatening messages to the Great March of Return’s organizers and to the Gaza Strip population, in addition to deploying Israeli snipers along the border fence. The Israeli forces stationed 30-70 meters away from the border fence and the closest point the protesters reached did not exceed 50 meters to the west of the border fence. Thus, the distance between the Israeli soldiers and protesters can not in any way pose any threat to the Israeli soldiers’ life, especially the demonstrators were unarmed. PCHR confirmed that the Israeli forces directly targeted a number of activists, who usually demonstrate along the border fence in any peaceful protests, in which they killed 3 of them in the northern Gaza Strip. PCHR’s investigations indicate that all the killed persons were hit to the head, neck, chest, and abdomen. One of them was hit to the back of the head. This proves that there is an official decision to kill and cause bodily harm to the demonstrators, in which most injuries were in the knee. Medical sources at the Gaza Strip hospitals stated that most of the wounded persons, who were hit with live bullets, suffered serious tissue laceration and deep wounds, which proves that the Israeli forces used explosive bullets. Further to what was mentioned above, on 30 March 2018, in new crime of extra-judicial execution committed by Israeli forces without any justification and without the latter posing threat or danger to life of the Israeli soldiers, the Israeli forces killed a Palestinian farmer while he was collecting parcel and wounded another after targeting them with 2 artillery shells while the farmers were in their land around 1000 meters away from the border fence with Israel, east of al-Qararah village, east of Khan Yunis in the southern Gaza Strip. As part of targeting the border areas, on 29 March 2018, Israeli forces fired 3 artillery shells at an open area, east of al-Amal neighbourhood, northeast of Beit Hanoun in the northern Gaza Strip, and no casualties were reported. On 30 March 2018, Israeli forces fired an artillery shell at an agricultural land in Gaza Valley (Juhor al-Deek). On 31 March 2018, Israeli forces fired an artillery shell at an agricultural land in Gaza Valley (Juhor al-Deek). Few hours, the Israeli forces fired another artillery shell at the abovementioned agricultural land, and no casualties were reported. As part of targeting fishermen in the sea, the Israeli forces continued to escalate their attacks against fishermen in the Gaza Sea, indicating to the on-going Israeli policy of targeting their livelihoods. PCHR’s fieldworkers monitored 4 shooting incidents; 3 in north-western Beit Lahia and another one in Western Soudaniyah, west of Jabalia in the northern Gaza Strip. In the West Bank, on 31 March 2018, a Palestinian civilian was hit with a live bullet to the right knee when an Israeli officer opened fire him. The wounded person was driving an illegal vehicle at the eastern entrance to Qasrah village, southeast of Nablus. His vehicle hit an Israeli police car that was in the area, so ‘Oudah left the car and attempted to flee. On 01 April 2018, 6 Palestinian civilians were wounded while participating in demonstrations against the Israeli forces, who moved into Abu Dis village, east of occupied East Jerusalem. The Israeli forces stationed near the al-Quds Abu Dis University campus. On 02 April 2018, Israeli forces stationed at ‘Inab military checkpoint, east of Tulkarm, opened fire at Mohamed Subhi ‘Anbar (46), from Tulkarm Refugee Camp, claiming that he attempted to carry out a stabbing attack. The Israeli forces then arrested Mohamed. On 03 April 2018, 2 Palestinian civilians, from Sabstiyia village, northwest of Nablus, were wounded when the Israeli forces moved into the village and stationed in al-Athar area. The Israeli forces moved into the village to protect hundreds of Israeli settlers. Meanwhile, a number of Palestinian young men gathered to confront them. On 04 April 2018, 2 Palestinian civilians were wounded when hundreds of Israeli settlers, under the Israeli forces’ protection, organized a large demonstration in Bita village, south of Nablus. The Israeli settlers then performed their religious rituals and Talmudic prayers on the occasion of the Jewish Holidays. Meanwhile, a group of Palestinian young men gathered and confronted the Israeli forces and settlers. As a result, the Israeli forces fired tear gas canisters and rubber coated at them. Further to the abovementioned injuries, during the reporting period 14 Palestinian civilians, including 2 children, were directly hit with live bullets and tear gas canisters while participating in a peaceful demonstration. The protesters threw stones at the Israeli forces stationed at the entrances to the Palestinian communities in the West Bank. These demonstrations came in the light of protests organized by Palestinian civilians in protest at the Trump’s decision to recognize Jerusalem as the capital of Israel, continuing the Israeli forces’ settlement crimes, confiscating Palestinian lands, and due to the occasion of the 42nd anniversary of the Earth Day. During the reporting period, Israeli forces conducted at least 48 military incursions into Palestinian communities in the West Bank and 8 similar ones into Jerusalem and its suburbs. During those incursions, Israeli forces arrested at least 41 Palestinians, including 5 children, in the West Bank. 23 civilians, including 10 children, were arrested in Jerusalem and its suburbs. On 29 March 2018, Israeli forces handed 2 Palestinian civilians in Saf area, north of Beit Ummer village, north of Hebron, 2 notices to stop construction under the pretext of non-licesning in area C.
As part of the Israeli settlers’ attacks against the Palestinian civilians and their property, on 30 March 2018, Sami Hafiz al-Hraini (21), from Tawanah village, east of Yatta, south of Hebron, sustained fractures to the right leg after he was deliberately subjected to a run over attack by an Israeli settler. On 01 April 2018, two Israeli settlers from “Gush Etzion” settlement, south of Bethlehem, flood Palestinian civilians’ lands with wastewater in Wad Shakheet area, east of Beit Ummer village, north of Hebron. On the same day, a group of Israeli settlers threw stones at Palestinians civilians’ vehicles on bypass road adjacent to “Beit Hagai” settlement, south of Hebron. On 04 April 2018, a group of Israeli settlers from “Hafat Gilead” settlement, attacked 5 vehicles belonging to civilians from Fer’itah village, northeast of Qalqiliyia. The Israeli settlers wrote racist slogans on the vehicles and punctured their tires. At approximately 02:00, Israeli forces moved into several neighbourhoods in Hebron. They raided and searched a number of houses and then arrested 4 civilians, including a child, namely Yazan ‘Ata’a ‘Essa al-Rajbi (17), Redwan Mohammed Zeyadah (20), Monther Malek Qafishah (21) and Mo’en ‘Ali al-Joulani (19). Around the same time, Israeli forces accompanied with 3 military vehicles moved into Beit Kahel village, northwest of Hebron and stationed near the industrial Area. They raided and searched a house belonging to Osama Fadel ‘Ayed ‘Asafrah (23) and then arrested him. Around the same time, Israeli forces moved into Salem village, northeast of Nablus. They raided and searched several houses and then arrested Mohsen Husein ‘Essa (27), Anas ‘Akef Eshtieh (23) and Malek Mesbah Hamdan (18). Around the same time, Israeli forces moved into Balata refugee camp, east of Nablus. They raided and searched a number of houses and then arrested Diya’a Yusuf al-Moghrabi (21). At approximately 06:00, Israeli forces moved into Kuber village, north of Ramallah. They raided and searched a house belonging to Faisal Sa’ed Daras (32) and then arrested him and took him to “Ofer” prison established on lands of Betunia village, southwest of the city. At approximately 03:00, Israeli forces moved into Jenin. They raided and searched a number of houses and then arrested Aws Mahmoud ‘Ajawi (25). At approximately 20:00, Israeli forces stationed along the border fence between the Gaza Strip and Israel fired 3 artillery shells at an open area, east of al-Amal neighbourhood, northeast of Beit Hanoun in the northern Gaza Strip. The targeted area is about 500 meters into the west of the abovementioned border fence. Ambulances rushed to the area, but there were no casualties. Note: During the aforementioned day, Israeli forces conducted (3) incursions in the following areas and no arrests were reported: al-‘Aroub refugee camp; al-Thaheriyah and Sa’ir villages in Hebron. At approximately 01:00, Israeli forces accompanied with 3 military vehicles moved into Jawhar Mount neighbourhood in the southern area in Hebron. They raided and searched a house belonging to Mohammed Abdul Hamid al-Rajbi (48) and then arrested him and his son Osama (22). In new crime of extra-judicial execution committed by Israeli forces without any justification and without the posing threat or danger to life of the Israeli soldiers, the Israeli forces killed on the dawn a Palestinian farmer while he was collecting parcel and wounded another after targeting them with 2 artillery shells while they were in their land around 1000 meters away from the border fence with Israel, east of al-Qararah village, east of Khan Yunis in the southern Gaza Strip. According to PCHR’s fieldworkers, at approximately 04:10 on the same day morning, Israeli forces stationed behind the border fence between the Gaza Strip and Israel, east of Khan Yunis, fired 2 artillery shells at 2 civilians who were collecting parcel from an agricultural land around 1200 meters away from the border fence with Israel, east of al-Qararah, east of Khan Yunis. As a result, one of them, namely ‘Omer Wahid Nasrallah Abu Sammour (27), was killed arrived pieces at the Gaza European Hospital while the other namely Ahmed Selm Salim al-Shami (23), from al-Qararah, sustained shrapnel throughout his body and his injury was classified as moderate. Both civilians stayed in the area for 30 minutes until the medical crews were able to reach them. they were then transfer them to Gaza European Hospital. According to observations of PCHR’s fieldworker in the area where the shelling happened, the 2 shells fell on a land that is planted with parcel, 20 meters into the north of the farmers Abu Sammour and al-Shami, knowing that the area can be clearly seen from the border fence, which is adjacent to the land from the east and north and the land is planted with vegetables that do not hinder the vision from the Israeli sites established along the border fence. At approximately 16:00, Israeli forces stationed along the border fence between the Gaza Strip and Israel, fired 2 artillery shells at 2 checkpoints belonging to Palestinian armed groups in Gaza Valley (Juhor al-Deek), but no casualties were reported. Note: During the aforementioned day, Israeli forces conducted (4) incursions in the following areas and no arrests were reported: Ethna, Beit Ummer, Bani Na’im and al-Majd villages in Hebron. At approximately 01:00, Israeli forces moved into al-‘Aroub refugee camp, north of Hebron. They raided and searched 2 houses belonging to Mahmoud Yusuf Madi (14) and Ahmed Amjad Jawabrah (19) and then arrested them. At approximately 01:20, Israeli forces stationed along the border fence between the Gaza Strip and Israel fired an artillery shell at an agricultural land in Gaza Valley (Juhor al-Deek), but no casualties were reported. At approximately 06:30, Israeli forces stationed along the border fence between the Gaza Strip and Israel fired an artillery shell at an agricultural land in Gaza Valley (Juhor al-Deek), but no casualties were reported. At approximately 10:30, civilian Mo’atasem Marmar Mahmoud ‘Oudah (20) was driving an illegal vehicle at the eastern entrance to Qasrah village, southeast of Nablus adjacent to “Magdolim” His vehicle hit an Israeli police car that was in the area, so ‘Oudah left the car and attempted to flee. A police member opened fire at him. As a result, ‘Oudah was hit with a live bullet to the right knee and a shrapnel to the right foot. He was transferred by a civil car to Rafidiya Hospital in Nablus to receive medical treatment. Note: During the aforementioned day, Israeli forces conducted (4) incursions in the following areas and no arrests were reported: al-Fawar refugee camp, Surif, Traqumiya and al-Mawreq villages in Hebron. At approximately 03:00, Israeli forces moved into al-Khader village, south of Bethlehem and stationed in Um Rukbah neighborhood. They raided and searched a house belonging to Mahmoud al-Wahsh and then arrested his sons Mohanned (18) and Hamzah (16). Activist Ahmed Salah said to PCHR’s fieldworker that the soldiers ruined the house contents and maltreated the inhabitants and caused fear among children and women. At approximately 07:30, Israeli gunboats stationed off al-Wahah shore, northwest of Beit Lahia in the northern Gaza Strip, heavily opened fire at Palestinian fishing boats sailing within 3 nautical miles and chased them. As a result, the fishermen were forced to flee fearing for their lives, but neither casualties nor material damage was reported. Note: During the aforementioned day, Israeli forces conducted (4) incursions in the following areas and no arrests were reported: Dura and Beit Marsam village in Hebron; Bethlehem and ‘Aydah refugee camp, north of the city. At approximately 01:00, Israeli forces moved into Kafer Qaddoum village, northeast of Qalqiliyah. They raided and searched a number of houses and then arrested ‘Ezzat Ghazi ‘Obaid (20). Around the same time, Israeli forces moved into Beit Fajjar village, south of Bethlehem. They raided and searched a house belonging to Mahmoud Mohammed Thawabtah (25) and then arrested him. At approximately 02:30, Israeli forces moved into Nablus. They raided and searched a number of houses and then arrested Mohammed Mahrous Kawni (20), Khalid al-Taweel (20), both are students at An-Najah National University, and Hamzah Ja’far Khuweirah (19). Around the same day, Israeli forces moved into Kafer Dan village, west of Jenin. They raided and searched a number of houses and then arrested Mohammed Ahmed Abu Salah (25). Around the same time, Israeli forces moved into ‘Aqraba village, southeast of Nablus. They raided and searched a house belonging to Abdul Rahman Maher Bani Fadel, who carried out a stab attack in Jerusalem on 18 March 2018. 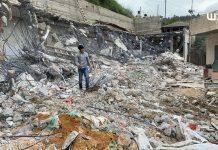 The Israeli forces handed the family a decision signed by the Israeli forces’ commander in the West Bank to confiscate and demolish a part of the house. Due to the confiscation and demolition decision, Abdul Rahman carried out the attack. At approximately 04:25, Israeli forces moved into Tulkarm. They raided and a house belonging to Aws Mohammed Khader Husari (23) and then arrested him. At approximately 06:30, Israeli gunboats stationed off al-Wahah shore, northwest of Beit Lahia in the northern Gaza Strip, heavily opened fire at Palestinian fishing boats sailing within 3 nautical miles and chased them. The shooting recurred at approximately 07:30 and continued until approximately 10:00 on the same day. As a result, the fishermen were forced to flee fearing for their lives, but neither casualties nor material damage was reported. At approximately 17:00, Israeli forces stationed at al-Teen Valley checkpoint (‘Inab Checkpoint), east of Tulkarm, opened fire at Mohammed Sobhi ‘Anbar (46), from Tulkarm refugee camp, claiming he attempted to carry out a stab attack. Israeli sources said to PCHR’s fieldworker that the Israeli forces transferred Mohammed to an Israeli hospital in Israel after they opened fire at him wounding him to the waist claiming that he ran towards Israeli soldiers stationed at the abovementioned checkpoint. Karim ‘Ajwah, lawyer at the Commission of Detainees and ex-Detainees Affairs said in a statement on Tuesday, 03 April 2018, that Mohammed is at “Meir” Medical Center in “Kfar Saba”. Mohammed underwent a surgery and still Intensive Care Unit (ICU) under the respiratory device. Note: During the aforementioned day, Israeli forces conducted (4) incursions in the following areas and no arrests were reported: Hebron, Beit Kahel and Sebastia village, northwest of Nablus; and Salfit. At approximately 01:00, an Israeli infantry unit moved into the eastern neighborhood in al-‘Aroub refugee camp, north of Hebron, which is adjacent to the Bypass Road (60). They raided and searched a house belonging to Yusuf Isma’il Madi (48). He soldiers locked the family members in one room and attacked them. The soldiers then arrested Yusuf’s son Khader (22) and confiscated a cell phone from his sister. The Israeli forces took Khader to the detention center in “Gush Etzion” settlement complex, south of Bethlehem. It should be noted that the Israeli authorities raided the abovementioned house on 01 April 2018. They arrested Yusuf’s son Mahmoud (14), who underwent investigation and beating by the soldiers. He was released him one day later. At approximately 02:00, Israeli forces moved into Tubas. They raided and searched a number of houses and then arrested Ahmed Fawzi Sa’ed Sawaftah (26), and Mowafaq Samir Abu al-Hassan (23). At approximately 05:00, the Israeli forces withdrew from the city. At approximately 03:00, Israeli forces moved into Qabatiyah village, southeast of Jenin. They raided and searched several houses and then arrested Aysam ‘Emad Zakarneh (21), Mahmoud Riyad Zakarneh (15) and Mandoub Bassem Kamil (17). At approximately 03:20, Israeli forces moved into Qarawet Bani Hassan village, northwest of Salfit. They raided and searched 2 houses belonging to ‘Omeir ‘Ammar Mar’ie (21) and Rateb Abdul Karim Abdul ‘Aziz Mar’ie (21), a student at Palestine Polytechnic University, and then arrested them. Around the same time, Israeli forces moved into Kufor Malek village, northeast of Ramallah. They raided and searched 2 houses belonging to Ibrahim Saleh Ba’irat (19) and Khalid Hasan Ba’irat (22) and then arrested them. At approximately 04:00, Israeli forces moved into Barqa village, southeast of Ramallah. They raided and searched a house belonging to Bassem Hasan Mo’tan (40) and then arrested him. In the morning hours, Israeli forces moved into Sebastia village, northwest of Nablus and stationed in al-Athar area to protect hundreds of Israeli settlers, who raided the area travelling by dozens of buses to hold celebrations for Jewish holidays. The Israeli forces closed the surrounding area and denied Palestinian civilians access to it. At approximately 12:30, the Israeli forces expanded the closed area to the center of the village and stationed there. After that, school students were leaving, so clashes erupted. The young men threw stones and empty bottles at the Israeli forces. The Israeli forces fired live and rubber bullets at them. As a result, 2 civilians were wounded. One of them was hit with a rubber bullet to the buttocks while the other was hit with a live bullet to the right knee. At approximately 16:00, Hakam Ahmed Foqaha (22) surrendered to the Israeli forces stationed at Tayasir checkpoint, east of Tubas. The Israeli forces raided and searched the house on the dawn searching for him and then handed the family an order to turn their son into them. At approximately 17:45, Israeli forces moved into ‘Eraq Burin village, south of Nablus. They raided and searched a number of hoses and then arrested Jamal Mo’atasem Qadous (21), a student at Hisham Hijjawi College, and Ahmed Husam ‘Ahed al-Faqih (20), a car driver. At approximately 20:00 on the same day, the Israeli forces withdrew from the village. Note: During the aforementioned day, Israeli forces conducted (3) incursions in the following areas and no arrests were reported: Hebron, Beit Ummer and Howarah village, south of Nablus. At approximately 00:00, Israeli forces moved into ‘Aqabet Jaber refugee camp, southwest of Jericho. They raided and searched a number of houses and then arrested Osamam ‘Essa Hadib (20), Khalid Safi (21) and Saleh Mohammed Abu Sharar (28). At approximately 01:00, Israeli forces moved into Nablus. They raided and searched a number of houses and then arrested Rushdi Mahmoud al-Qayem (21) from his house on al-Basha Street in Ras al-‘Ein neighborhood, south of the city. At approximately 05:30 on the same day, the Israeli forces withdrew from the city. At approximately 04:00, Israeli forces moved into al-Jalazoun refugee camp, north of Ramallah. They raided and searched a house belonging to Mohammed Hasan ‘Eliyan (23) and then arrested him. Around the same time, Israeli forces moved into Qarawet Bani Zaid village, northwest of Ramallah. They raided and searched a number of houses and then arrested Fathi Hamadallah ‘Arar (22). At approximately 08:00, Israeli gunboats stationed off al-Sudaniyah shore, west of Jabalia in the northern Gaza Strip, sporadically opened fire at Palestinian fishing boats sailing within 4 nautical miles and chased them. As a result, the fishermen were forced to flee fearing for their lives, but neither casualties not material damage was reported. At approximately 14:00 on Thursday, 29 March 2017, dozens of Palestinian children and young men gathered near the border fence between the Gaza Strip and Israel, east of the al-Buraij in the central Gaza Strip. They set fire to tires and threw stones at Israeli soldiers stationed behind sand barriers along the border fence. The soldiers fired live bullets and tear gas canisters at the protestors. As a result, a civilian was hit with a live bullet to the lower limbs. At approximately 15:30 on the same Thursday, dozens of Palestinian children and young men made their way to the border fence between the Gaza Strip and Israel, north of the Gaza Strip in preparation for the Land Day activity known as: “The Great March of Return and Breaking Siege”. The children and young men gathered near the security fence in Abu Safia area, east of Jabalia. They threw stones at Israeli soldiers stationed behind the border fence. The soldiers fired live bullets, rubber-coated metal bullets and tear gas canisters at them. As a result, a 28-year-old civilian from Khan Yunis was hit with a live bullet to the left leg. He was taken via an ambulance belonging to Palestine Red Crescent Society (PRCS) to the Indonesian Hospital and doctors classified his injury as moderate. At approximately 16:30 on the same Thursday, a number of Palestinian children and young men gathered about 250 meters away from the border fence between the Gaza Strip and Israel, north to the yard, which is designated for the Great March of Return” demonstration on Land Day, east of Khuza’ah and ‘Abasan villages, east of Khan Yunis, east of Khuza’ah village, east of Khan Yunis in the southern Gaza Strip. A number of them attempted to approach the security fence to throw stones at Israeli forces stationed behind sand barriers that are 100 meters away from the border fence. The soldiers fired live bullets and tear gas canisters at them for 3 hours. As a result, 3 civilians, including 2 children, were wounded. One of them was hit with a live bullet while the 2 others were directly hit with tear gas canisters. In the evening hours, dozens of Palestinian civilians gathered in the vicinity of al-Sheja’eya neighborhood, east of Gaza City, and then headed to Malakah Intersection area, east of al-Zaytoun neighborhood. They threw stones at Israeli soldiers stationed behind the border fence between the Gaza Strip and Israel. The soldiers fired live and rubber bullets and tear gas canisters at them. As a result, 2 civilians, including a child, were wounded. At approximately 06:30, on Friday, 30 March 2017, thousands of Palestinian civilians started swarming to camps established by the Supreme National Authority for the Great March of Return and Breaking Siege” on Land Day. They were about 700 meters away from the border fence between the Gaza Strip and Israel, east of al-Buraij in the central Gaza Strip. A number of them approached the border fence, set fire to tires and threw stones at Israeli soldiers stationed behind sand barriers along the border fence. The soldiers fired live bullets and tear gas canisters at the protestors. The clashes, which continued for hours, resulted in killing 2 civilians namely ‘Abdel Qader Mardi Soliman al-Hawajri (42) from al-Nussairat was hit with a bullet to the abdomen, and Naji ‘Abdullah Shehdah Abu Hujeir (25) from al-Bureij was hit with a bullet to the abdomen and he died in the evening hours. Moreover, 166 protestors, including 30 children and 4 women, were wounded. The injuries of 7 of them were classified as serious. They were taken by PRCS ambulances to al-Aqsa Hospital in Deir al-Balah. Fifteen of the wounded civilians were transferred to al-Shifa Hospital in Gaza to receive the needed medical treatment. Ahmed Ibrahim ‘Ashour ‘Odah (19) from al-Shati’ Refugee Camp was hit with a bullet to the head, east of Gaza. Mahmoud Sa’di Younis Rohmi (34) from Gaza City was hit with a bullet to the chest, east of Gaza. Mohammed Na’im Mohammed Abu ‘Omer (25) from al-Shija’iyah was hit with a bullet to the abdomen, east of Gaza. Jihad Ahmed Freinah (35) from Gaza was hit with a bullet to the head, east of Gaza. The total number of the wounded civilians was 337 civilians. Al-Shifa Hospital received 284 wounded civilians, including 70 children and 11 women. One hundred and fifty of them were hit with live bullets and 118 were hit with rubber bullets. Doctors classified the injury of 10 civilians, including 3 children, as serious. Moreover, 53 wounded civilians, who sustained live bullet wounds, were transferred to al-Quds Hospital. Around the same time, thousands of Palestinians of different ages within entire families started swarming to a camp established by the Supreme National Authority for the Great March of Return and Breaking Siege in al-Shawkah village, east of Rafah. At approximately 10:00, a number of the participants attempted to approach the border fence between the Gaza Strip and Israel in the eastern Gaza Strip. Israeli soldiers stationed behind sand barriers about 150 meters away from the border fence sporadically and directly fire live bullets at protestors and prevented them from approaching the border fence. The Israeli forces continued firing live and rubber bullets at the protestors until approximately 20:00. As a result, Amin Mahmoud Mansour Mo’amar (26) was hit with a live bullet to the abdomen. Mo’amar died after he underwent a surgery in Gaza European Hospital. Moreover, Ibrahim Salah Ibrahim Abu Sha’er (17), immediately died after being hit with a live bullet to the neck. As a result, 118 civilians, including 27 children and 3 women, were wounded. Doctors classified the injury of 8 civilians as serious. Bader Fayeq Ibrahim al-Sabbagh (19) was hit with a bullet to the head. Around the same time, thousands of civilians, including women, children and elderlies, started swarming to camps established by the Supreme National Authority for the Great March of Return and Breaking Siege, east of Khuza’ah village, east of Khan Yunis in the southern Gaza Strip, on an area of 20 dunums, which include 20 camps within the “Great March of Return” Activity in the anniversary of the Land Day. Dozens of participants gathered outside the yard and to the north of the sand barriers surrounding it around 200 to 300 meters away from the border fence between the Gaza Strip and Israel. The participants were waving Palestinian flags and some of them attempted to reach border fence where dozens of Israeli soldiers stationed behind sand barriers that are around 30 meters away from the border fence. According to field observations by PCHR’s fieldworkers, dozens of Israeli snipers stationed behind sand barriers along the border fence sporadically and deliberately opened fire at the participants in the peaceful assemblies causing a number of injuries. After the Friday prayers, the number of participants increased after thousands of busses carrying passengers and people walking on foot arrived at the area. The number of participants was estimated at 30,000 persons. The Israeli forces continued firing live bullets and tear gas canisters at the protestors despite the peaceful atmosphere in the demonstration and the presence of women and children as the protestors did not pose any threat to the lives of the Israeli soldiers. The observations of PCHR’s fieldworkers revealed that the Israeli snipers stationed behind sand barriers sporadically and deliberately opened fire at the participants in the in addition to firing tear gas canisters in the middle of the peaceful assembly that included large numbers of women and children. the Israeli forces also focused on targeting the participants in the back rows of the demonstration as they were falling one by one around 300 meters away from the border fence in addition to others who attempted in a few numbers to approach the fence. The shooting continued until approximately 20:00. As a result, Jihad Zuhair Abu Jamous (30) from Khan Yunis was killed after being hit with a bullet to the head at approximately 16:30. He was transferred to Gaza European hospital where his death was announced after 3 hours. Moreover, 234 civilians, including 34 children, 18 women and a journalist, were wounded. One hundred and ninety three of them, including 24 children and 13 women, were hit with live bullets while the others were hit with tear gas canisters and rubber bullets. The wounded civilians were transferred to Nasser, Gaza European and Algerian Hospitals in Gaza. Doctors classified the injury of 24 civilians as serious. At approximately 10:00 on Monday, 02 April 2018, medical sources in Gaza European Hospital announced the death of Fares Mahmoud Mohammed al-Raqab (26) from Bani Suhailah after he sustained a live bullet to the abdomen. At approximately 11:00 on Saturday, 31 march 2018, dozens of Palestinian protestors gathered near the border fence between the Gaza strip and Israel, east of al-Buraij in the central Gaza Strip. They set fire to tires and threw stones at Israeli forces stationed behind sand barriers along the border fence. The soldiers fired live bullets and tear gas canisters at them. The clashes continued until the evening hours on the same day. As a result, 11 civilians, including a child and a journalist, were wounded. They were transferred via PRCS ambulances to al-Aqsa Hospital in Deir al-Balah. Doctors classified the injury of a civilian as serious while the others’ injuries as moderate. At approximately 13:00 on the same Saturday, dozens of Palestinians made their way to the border fence between the Gaza Strip and Israel in the northern Gaza Strip and then gathered into the east of Abu Safia Hill, northeast of Jabalia in the northern Gaza Strip at a distance ranging from 50 to 150 meters into the west of the border fence. The protestors set fire to tires and threw stones at Israeli soldiers stationed behind sand barriers that is around 100 meters away from the border fence. The soldiers fired live and rubber bullets at them. The clashes continued until the evening hours on the same day. As a result, 11 civilians, including 2 children, were wounded. Eight of them were hit with live bullets to their lower limbs and 3 civilians were hit with tear gas canisters. Around the same time, dozens of Palestinian civilians gathered in the vicinity of al-Sheja’eya neighborhood, east of Gaza city and the headed to Malakah intersection area, east of al-Zaytoun neighborhood. They threw stones at the Israeli soldiers stationed behind the border fence between the Gaza Strip and Israel from far distances. The soldiers fired live bullets, rubber-coated metal bullets and tear gas canisters at them. as a result, 17 civilians, including 3 children, were wounded. At approximately 14:00, hundreds of Palestinians participating in the Great March demonstrations gathered near the border fence between the Gaza Strip and Israel, east of al-Shawkah village, east of Rafah in the southern Gaza Strip. A number of them raised the Palestinian flags and attempted to approach the border fence to throw stones at Israeli soldiers. The soldiers sporadically fired live and rubber bullets and tear gas canisters at them until approximately 19:00 on the same day. As a result, 6 civilians, including a child, sustained wounds to the lower limbs. They were transferred to Abu Yusuf al-Najjar Hospital in Rafah. Doctors classified their injuries as moderate. At approximately 16:00 on the same Saturday, a number of Palestinian children and young men gathered about 250 meters away from the border fence between the Gaza Strip and Israel, north of “Return Camp” established into the east of Khuza’ah village, east of Khan Yunis in the southern Gaza Strip. A number of them attempted to approach the border to throw stones at Israeli soldiers stationed behind sand barriers that were about 30 meters away from border fence. the soldiers sporadically fired live bullets and tear gas canisters at the protestors for 3 hours. As a result, 2 civilians were hit with a tear gas canister to the head. They were transferred to Gaza European Hospital in Khan Yunis and doctors classified their injuries as moderate. At approximately 13:00 on Sunday, 01 April 2018, dozens of Palestinian protestors made their way to the border fence between the Gaza Strip and Israel in the northern Gaza Strip. They gathered in the east of Abu Safia Hill, northeast of Jabalia in the northern Gaza Strip, 50- 150 meters away from the border fence. They set fire to tires and threw stones at Israeli soldiers stationed behind sand barriers that were 100 meters away from the abovementioned border fence. The soldier fired live bullets, rubber-coated metal bullets and tear gas canisters. The clashes continued until the evening hours. As a result, 5 civilians were hit with live bullets to their lower limbs. Doctors classified the injury of a civilians as serious. Around the same time, dozens of protestors gathered near the border fence between the Gaza Strip and Israel, east of al-Buraij in the central Gaza Strip, within the “Great March of Return” activities. They protestors threw stones at Israeli soldiers stationed behind sand barriers along the border fence. The soldiers fired live bullets and tear gas canisters at them. The clashes continued until the evening hours. As a result, 2 civilians were hit with tear gas canisters. At approximately 15:00 on the same Sunday, a number of Palestinian children and young men gathered 200-250 into the west of border fence between the Gaza Strip and Israel, north of the “Great March of Return” camp established into the east of Khuza’ah villages, east of Khan Yunis. A number of them attempted to approach the border fence to set fire to tire and threw stones at Israeli soldiers stationed behind sand barriers that are about 30 meters away from the border fence. The soldiers sporadically fired live bullets and tear gas canisters at them. At approximately 15:23, Tahreer Mahmoud Sa’ed Wahbah (18,) from Ma’an in Khan Yunis, was hit with a live bullet to the head. He was transferred to Gaza European Hospital and his injury was classified as serious. Wahbah’s relatives said to PCHR’s fieldworker that he suffers from speech disorder. The Israeli forces further continued firing live bullets and tear gas canisters in the area. According to PCH’s observations, a tear gas canister targeted the camp’s yard causing tear gas inhalation to a hundreds of civilians who were in the place, including women and children and entire families. At approximately 13:00 on Sunday, 02 April 2018, dozens of Palestinian protestors made their way to the border fence between the Gaza Strip and Israel in the northern Gaza Strip and gathered near Abu Safia Hill, northeast of Jabalia in the northern Gaza Strip, 50-150 into the west of the border fence. They set fire to tires and threw stones at the Israeli forces stationed behind sand barriers that were 100 meters into the west of the border fence. The soldiers fired live and rubber bullets and tear gas canisters at them. The clashes continued until the evening hours. As a result, 2 civilians were wounded. One of them was hit with a live bullet and the other was hit with a rubber bullet. Around the same time, dozens of Palestinian protestors gathered near the border fence between the Gaza Strip and Israel, east of al-Buraij in the central Gaza strip within the “Great March of Return” activities upon an invitations sent by the Supreme National Authority for the Great March of Return and Breaking Siege in the Gaza Strip. The protestors threw stones at Israeli soldiers stationed behind sand barriers along the border fence. The soldiers fired live bullets and tear gas canisters at the protestors. As a result, 2 civilians were wounded. One of them was hit with a live bullet to the lower limb and the other was hit with a tear gas canister to the right hand. At approximately 13:30, dozens of Palestinian civilians gathered in the vicinity of al-Sheja’eya neighborhood intersection, east of Gaza City and then headed to Malakah intersection area, east of al-Zaytoun neighborhood. They threw stones at Israeli soldiers stationed behind the border fence between the Gaza Strip and Israel from far distances. The soldiers fired live and rubber bullets and tear gas canisters at them. As a result, 2 civilians were wounded. At approximately 15:00 on the same Monday, dozens of Palestinian civilians participating in the “Great March of Return” gathered near the border fence between the Gaza Strip and Israel, east of al-Shawkah village, east of Rafah in the southern Gaza Strip. A number of them raised the Palestinian flags and attempted to approach the border fence. Israeli soldiers sporadically fired live bullets and tear gas canisters until approximately 19:00 on the same day. As a result, a civilian was hit with a live bullet to the right leg. At approximately 18:25, Israeli forces stationed behind the border fence between the Gaza Strip and Israel, northeast of the demonstration yard, east of Khuza’ah village, east of Khan Yunis in the southern Gaza Strip, fired live bullets and tear gas canisters at a group of Palestinian protestors who were in the area. The protestors set fire to tires, attempted to approach the border fence and threw stones at Israeli forces stationed behind sand barriers that were about 30 meters away from the border fence. As a result, a civilian was hit with a live bullet to the lower limbs. At approximately 16:10 on Tuesday, 03 April 2018, Israeli soldiers stationed behind the border fence killed Ahmed Omer Mohammed ‘Arafah (25) from Deir al-Balah within the “Great March of Return” activities established by the Supreme National Authority for the Great March of Return and Breaking Siege in the Gaza Strip. The soldiers opened fire at t a number of Palestinian civilians who approached the border fence. As a result, ‘Arafah was hit with 2 live bullets to the back that penetrated the chest and to the left hand. He was transferred to al-Aqsa Hospital in Deir al-Balah. Doctors announced ‘Arafah’s death immediately after his arrival to the hospital. At approximately 16:00 on the same Tuesday, dozens of Palestinian protestors made their way to the border fence between the Gaza Strip and Israel in the northern Gaza Strip and then gathered into the east of Abu Safia hill, northeast of Jabalia in the northern Gaza Strip, 50-150 meters into the west of the border fence. The protestors set fire to tires and threw stones at Israeli soldiers stationed behind sand barriers that were about 100 meters into the east of the border fence. the soldiers fired live and rubber bullets and tear gas canisters at the protestors. The clashes continued until the evening hours. As a result, 3 civilians were hit with tear gas canisters. At approximately 1:15 on Wednesday, 04 April 2018, dozens of Palestinian civilians gathered in the vicinity of al-Sheja’eya neighborhood intersection, east of Gaza City and then headed to Malakah intersection area, east of al-Zaytoun neighborhood. They threw stones at Israeli soldiers stationed behind the border fence between the Gaza Strip and Israeli form close distances. The soldiers fired live and rubber bullets and tear gas canisters at them. As a result, a civilian was hit with a live bullet to the right leg. Note: Israeli forces daily continued to fire live bullets and tear gas canisters at the protestors and the areas where they gathered throughout the Gaza Strip. PCHR did not document the shooting incidents that didn’t result in injuries among the protestors. PCHR emphasized that hundreds of civilians sustained tear gas inhalation, and dozens were either wounded or hurt. Following the Friday prayer on 30 March 2018, dozens of Palestinian children and young men gathered at the northern entrance to al-Birah. They threw stones and empty bottles at Israeli soldiers stationed at “al-Mahkamah” checkpoint near “Beit Eil” settlement, north of the city. The Israeli soldiers fired live bullets and rubber bullets, sound bombs and tear gas canisters at the protestors. As a result, a 19-year-old civilian was hit with a rubber bullet to the right thigh, a 26-year-old civilian was hit with a rubber bullet to the left foot, a 20-year-old civilian was hit with a Two-Two bullet to the foot and thigh, a 27-year-old civilian was hit with a rubber bullet to the right hand, and a 25-year-old civilian was hit with a rubber bullet to the foot. The wounded civilians were transferred via PRCS ambulances to Palestine Medical Complex to receive medical treatment. Doctors classified their injuries as moderate. Dozens of Palestinian civilians organized protests in al-Mazr’ah al-Gharbiyah villages, northwest of the Ramallah. They threw stones and empty bottles at Israeli soldiers stationed at the village entrance. The Israeli fired live and rubber bullets, sound bombs and tear gas canisters. As a result, 4 civilians, including a child, were wounded. They were transferred by Palestine Red Crescent Society (PRCS) ambulances to Palestine Medical Complex in Ramallah to receive medical treatment. Doctors classified his injury as moderate. The soldiers also arrested Mohammed Sa’ed Abu Qare’a (30). At approximately 12:45, dozens of Palestinians and international activists organized a protest from the center of Kufor Qaddoum village, northeast of Qalqiliyah and headed to the eastern entrance to the village, which has been closed for 15 years. They threw stones at Israeli soldiers stationed at the abovementioned entrance. The Israeli soldiers fired live rubber bullets, sound bombs and tear gas canisters at the protestors. As a result, 4 civilians, including 2 children and Mohammed Mahmoud ‘Enaya (28), a photojournalist at Palestine TV Channel, were wounded. Around the same time, dozens of Palestinian civilians, international human rights defenders and Israelis organized protests in Ni’lin, Bil’in, and Budrus villages west of Ramallah, al-Nabi Saleh and al-Mazr’ah al-Gharbiyah villages, northwest of the city. The Israeli forces used force to disperse the protestors by firing live and rubber bullets, sound bombs and tear gas canisters. As a result, a 25-year-old civilian from al-Mazr’ah al-Gharbiyah village was hit with a tear gas canister to the abdomen. A PRCS ambulance crew offered medical treatment to him on the spot. Following the same Friday prayer, dozens of Palestinian civilians organized a peaceful demonstration in al-Laban al-Shaqriqiyah village, south of Nablus. They threw stones and empty bottles at Israeli soldiers stationed in the entrance to Ramallah-Nablus Street. The soldiers fired live and rubber bullets, sound bombs and tear gas canisters at them. As a result, a 19-year-old civilian was hit with a live bullet to the leg. He was transferred to Arafat hospital in Salfit to receive medical treatment. On Friday afternoon , dozens of Palestinian civilians organized a protest in Bilal Ben Rabah Mosque area (Rachel’s Tomb) near the northern entrance to Bethlehem on the 42an anniversary of the Land Day. They put stone barricades and tires on fire near the military Checkpoint (300) between East Jerusalem and Bethlehem. They threw stones and empty bottles at Israeli soldiers. The soldiers chased the protestors amidst opening fire. The soldiers raided a restaurant located in the main street near al-‘Ezzah refugee camp and then arrested Amjad al-Qarbi (16). Clashes erupted in the vicinity of ‘Aydah refugee camp adjacent to the abovementioned checkpoint. The soldiers then moved into the camp and chased a number of the children and youngsters. They arrested 3 children after heavily beating them. The arrestees were identified as Ahmed Hatem (13), Ahmed Na’im and Mohammed Atallah (13). At approximately 16:00 on Saturday, 31 March 2018, Palestinian civilians and International activists organized a protest in the center of Kufor Qaddoum village, northeast of Qalqiliyah near the eastern entrance to the village. They threw stones at Israeli forces stationed at the abovementioned entrance. The Israeli forces fired rubber bullets, sound bombs and tear gas canisters at them. As a result, 2 children were hit with rubber bullets. At approximately 11:00 on Sunday, 01 April 2018, a group Palestinians organized a protest from the center of Deir Balout village, west of Salfit with the participation of Salfit Mayor, the Civil Defense, Director of the Wall and Settlement Resistance Committee and other civil organizations into Kherbat Beit Ta’mur, which is adjacent to the border fence and threatened to be confiscated by the Israeli forces. The participant planted olive seedlings. The Israeli forces fired rubber bullets, sound bombs and tear gas canisters at the. As a result, Fares Ibrahim Mohammed Nasser (56), Head of the Labor Department in the Wall and Settlement Resistance Committee, from Deir Qaddis village, west of Ramallah, was hit with a rubber bullet to the right hand. At approximately 18:30 on Monday, 02 April 2018, dozens of Palestinian civilians organized a peaceful demonstration in the center of al-Nabi Saleh village, northwest of Ramallah. The protestors threw stones and empty bottles at Israeli soldiers stationed at the village entrance. The soldiers fired live and metal bullets, sound bombs and tear gas canisters at them. As a result, 4 civilians were hit with live bullets. Three of them were transferred via PRCS ambulances to Yasser Arafat Hospital in Salfit to receive medical treatment and doctors classified their injuries as moderate. Moreover, Nehad Amin al-Barghuthi (19) via a Magen David Adom’s (MDA) ambulance to a hospital in Israel. Nehad was hit with a live bullet wound to the right side of the neck and doctors classified his injury as serious. Note: Due to technical reasons, we could not obtain the official statistics from the department responsible for issuing the statistics. Beit Hanoun (“Erez”) crossing, in the north of the Gaza Strip, is designated for the movement of individuals, and links the Gaza Strip with the West Bank. On Wednesday, 28 March 2018, Israeli forces allowed one person to return to the West Bank. On Sunday, 01 April 2018, Israeli forces allowed 14 Christian persons; on Monday, 02 April 2018, 9 Christian persons; and on Tuesday, 03 April 2018, 3 Christian persons to travel to the West Bank. On Friday, 30 March 2018, exit the Gaza Strip was from 07:30 to 13:00 for humanitarian cases, and return to the Gaza Strip was until 15:00 for Palestinian civilians, while the vehicles crossing was closed, except the emergency relief cases, were allowed to cross. On Saturday, 31 March 2018, the crossing was closed and all categories, except emergency relief cases, were prevented from travelling. On Sunday, 01 April 2018, and on Tuesday, 03 April 2018, exit the Gaza Strip was from 07:30 to 13:00 for humanitarian cases and Christian persons, return to the Gaza Strip was until 17:00 for Palestinian civilians, while until 13:00 for Israeli and foreigner travelers. The vehicles crossing works was from 08:00 to 13:00 (exit and enter). Hebron: Israeli forces established (26) checkpoints all over the city. On Thursday, 29 March 2018, Israeli forces established 4 checkpoints at the northern entrance to Yatta and at the entrances to Sa’ir, al-Shayyoukh and Beit ‘Awaa villages. On Friday, 30 March 2018, Israeli forces established 2 checkpoints at the southern entrance to Hebron and at the entrance to Samou’a village. On Saturday, 31 March 2018, 3 similar checkpoints were established at the western entrance to Hebron and at the entrances to al-Dahiryia and Ethna villages. On Sunday, 01 April 2018, Israeli forces established 5 checkpoints at the northern entrance to Halhoul village, at the western entrance to Hebron, at the entrances to Beit Ummer and Samou’a villages, and on Sureef-Beit Ummer Road. On Monday, 02 April 2018, 5 similar checkpoints were established at the northern and western entrances to Halhoul village, at the entrances to Samou’a and Beit ‘Awaa villages, and on Khelit al-Maiyah Road. On Tuesday, 03 April 2018, Israeli forces established 4 checkpoints at the entrances to al-Fawar and al-‘Aroub Refugee Camps, and at the entrances to Sa’ir and Samou’a villages. On Wednesday, 04 April 2018, Israeli forces established 3 checkpoints at the eastern entrance to Dura village, at the southern entrance to Hebron, and at the northern entrance to Halhoul village. Qalqiliyia: Israeli forces established (10) checkpoints all over the city. At approximately 11:50 on Thursday, 29 March 2018, Israeli forces established a checkpoint at the main entrance to Qalqiliyia. At approximately 09:05 on Friday, 30 March 2018, and at approximately 02:00 on Saturday, 31 March 2018, , the Israeli forces re-established the abovementioned checkpoint. At approximately 09:00 on Sunday, 01 April 2018, Israeli forces established a checkpoint near al-Nabi Iyyas village (on the main street between Qalqiliya and Tulkarm). At approximately 13:15, a similar checkpoint was established at the entrance to Jinasafout village, east of Qalqiliyia. On Monday, 02 April 2018, Israeli forces established 5 checkpoints at the eastern entrance to Qalqiliyia, at the entrance to ‘Azoun village, at the entrance to Baqet Hatab village, between ‘Azoun and Kafur Thulth villages, and between Jayyous and Kafur Jamal villages, north of the city. At approximately 22:00 on Friday, 30 March 2018, Israeli forces stationed at ‘Inab military checkpoint, east of Tulkarm, tightened their arbitrary measures against Palestinian civilians and obstructed their movement for few hours before re-opening the checkpoint. At approximately 16:00 on Monday, 02 April 2018, Israeli forces established a checkpoint at the entrance to Qarawet Bani Hassan village, northwest of Salfit. On Friday, 30 March 2018, Israeli forces deployed in the vicinity of “Karmiel “ settlement established om Palestinian civilians’ lands in Kherbit Um al-Khair, east of Yatta, south of Hebron, arrested Yaser ‘Eid Ameen al-Hathaleen (45), while breeding sheep near the settlement fence. In the evening, Yaser was released. At approximately 15:00 on Saturday, 31 March 2018, Israeli forces stationed at a military checkpoint arrested Basheer Jawad al-Showiki (16), and then took him via a military vehicle to an investigation center in “Kiryat Arba“ settlement, east of Hebron. The Israeli forces claimed that Basheer had a knife. At approximately 19:00 on Saturday, Israeli forces arrested Rebhi Mohamed Sider (25), from Hebron, after stopping him at a military checkpoint, southeast of Hebron. At Approximately 08:50 on Sunday, 01 April 2018, Israeli forces established a checkpoint at the eastern entrance to Qalqiliyia. They stopped Palestinian civilians’’ vehicles, checked the passengers’ IDs, and then arrested Mohamed ‘Ali Mohamed Swilem (21). At approximately 13:00 on Sunday, Israeli forces arrested ‘Emad Mohamed Salibi (22) after stopping his vehicle at a military checkpoint established at the entrance to Beit Ummer village, north of Hebron. At approximately 12:00, Israeli forces deployed at the entrance to al-‘Aroub technical college, north of Hebron, arrested Mohamed Ahmed Naser Allah (22), from al-‘Aroub Refugee Camp, while leaving his college. The Israeli forces claimed that he threw stones at the soldiers. Around the same time, Israeli forces established a checkpoint at the entrance to Jayyous village, northeast of Qaliliyia. They stopped Palestinian civilians’’ vehicles, checked the passengers’ IDs, and then arrested Bilal Bassam al-Barghouthi (20), from Dir Ghassanh village. At approximately 16:00 on Sunday, 01 April 2018, Israeli forces arrested Loai Hani Suktan (17) while he was in Bab al-Zawiyia area, where clashes erupted between the Israeli soldiers and stone throwers. At approximately 19:00 on Tuesday, 03 April 2018, Israeli forces established a checkpoint on Jenin- Haifa Road. They stopped Palestinian civilians’’ vehicles, checked the passengers’ IDs, and then arrested Kareem Ahmed Najeeb ‘Amour (26). A person was hit with live bullets to the leg. Five persons were hit with rubber bullets, one of them was hit to the chest and 2 others were hit to the head. Eighty-seven persons were hit with tear gas canisters, 7 of them suffered tear gas inhalation and 5 others sustained burns throughout the body. At approximately 01:00 on Thursday, 29 March 2018, Israeli forces moved into al-‘Issawiyia village, northeast of occupied East Jerusalem. They raided and searched houses from which they arrested Mohamed Majdi ‘Atiyia (13), Mohamed Zakaria ‘Elian (17), Mohamed Abed al-Raouf Mahmoud (18), Ahmed Khaled Abu Shamalah (21), and ‘Ali Muhassin (20). At approximately 01:30, Israeli forces moved into Surbaher village, south of occupied East Jerusalem. They raided and searched a house belonging to Ayoub Nu’man ‘Afana (23) and then arrested him. At approximately 02:00, Israeli forces moved into ‘Anata village, northeast of occupied East Jerusalem. They stationed at the village intersection and attempted to arrest one of Palestinian civilians, whose name is unknown, but he fled. After the operation failure, the Israeli forces heavily opened fire at a vehicle near the Petrol Station in the village. Eyewitnesses said that a group of undercover units accompanied with Israeli forces opened fire at a vehicle near Abu Khalil Petrol Station, at ‘Anata village intersection, after they could not arrest the targeted person. The Eyewitnesses added that the Palestinian civilian fled and they did not know if he wounded or not due to the heavily shooting. PRCS stated that its crews arrived at ‘Anata village and did not find the vehicle while a large number of Israeli soldiers were in the vicinity of the vehicle. The Israeli forces confiscated the surveillance cameras from the Petrol Station after the incident. At approximately 04:00, Israeli forces moved into al-Ram village, north occupied East Jerusalem. They raided and searched a house belonging to Bahaa Kan’an and then arrested him. At approximately 14:00 on Thursday, Israeli forces moved into Beit Haninah village, north of occupied East Jerusalem. They raided and searched a house belonging to Mohamed Abu Rmilah and then arrested his 2 sons Ameer (8) and Hatem (10). At approximately 02:00 on Sunday, 02 April 2018, a large force of Israeli soldiers moved into al-‘Issawiyia village, northeast of occupied East Jerusalem. They raided and searched dozens houses from which they arrested 9 civilians, including 6 children. PCHR keeps the names of the arrested persons. At approximately 03:00 on Tuesday, 03 April 2018, Israeli forces moved into al-‘Issawiyia village, northeast of occupied East Jerusalem. They raided and searched houses from which they arrested Basel Raied Muhasin, Ma’moun Ahmed ‘Obaid, and Mohamed Abdul Hafiz ‘Atiyah. At approximately 06:00 on Tuesday, Israeli forces moved into Bab Hatah neighborhood in occupied East Jerusalem’s Old City. They raided and searched houses from which they arrested Mo’min al-Hasheem (19) and Saleem Hamouda (18). A 120-square-meter under-construction house comprised of 2 floor and belongs to Sami Ahmed Mostafa Ikhlayil. A 70-square-meter house comprised of one floor and belongs to Jamal Ghnimaat. At approximately 09:00 on Tuesday, 03 April 2018, Israeli forces notified Ahmed and Mahmoud Yunis Abu Aiyash to seize their plot of land, which is adjacent to a military watchtower established at the eastern entrance to Beit Ummer villag, north of Hebron, and use it for military purposes. The Israeli authorities claimed that they intend to supply the military watchtower with a power line from a plot of land established in Seder al-Zaytoun area in the village. On Sunday, 01 April 2018, Israeli settlers from” Gush Etzion” settlement, south of Bethlehem, flood Palestinian civilians’ lands with wastewater in Wad Shakheet area, east of Beit Ummer village, north of Hebron. The abovementioned lands belong to Bahar and Sabarnah families. As a result, the Palestinian farmers endured heavy material losses. At approximately 18:00, Israeli settles threw stones at Palestinian civilians’ vehicles parked on the bypass road adjacent to “Beit Hajjai” settlement, which is established in Palestinian civilians’ lands, south of Hebron. No causalities were reported. At approximately 12:30 on Wednesday, 04 April 2018, hundreds of Israeli settlers, under the Israeli forces’ protections, organized a large demonstration in Bita village, south of Nablus. The Israeli settlers station in ‘Ain Rojan area, east of Bita village. They then performed their religious rituals and Talmudic prayers on the occasion of the Jewish Holidays. A group of Palestinian young men gathered and confronted the Israeli forces and settlers and threw stones at the settlers. The Israeli forces immediately fired tear gas canisters and rubber bullets at the protesters and then chased them. The Israeli settlers attacked Zahran Hasan Hussain Hamayil (24), so he sustained fractures to the right hand and was then taken to Rafidia Hospital in Nablus. The shooting led to the wounding of 2 protesters, who were then taken to Ibn Sina center in Hawarah village to receive medical treatment. PCHR welcomes the UN Security Council’s Resolution No. 2334, which states that settlements are a blatant violation of the Geneva Conventions and calls upon Israel to stop them and not to recognize any demographic change in the oPt since 1967. PCHR hopes this resolution will pave the way for eliminating the settlement crime and bring to justice those responsible for it. PCHR further reiterates that the Gaza Strip and the West Bank, including East Jerusalem, are still under Israeli occupation in spite of Israel’s unilateral disengagement plan of 2005. PCHR emphasizes that there is international recognition of Israel’s obligation to respect international human rights instruments and international humanitarian law. Israel is bound to apply international human rights law and the law of war, sometimes reciprocally and other times in parallel, in a way that achieves the best protection for civilians and remedy for the victims. PCHR calls upon the ICC this year to open an investigation into Israeli crimes committed in the oPt. For further information please visit our website www.pchrgaza.org or contact PCHR’s office in Gaza City, Gaza Strip by email pchr@pchrgaza.org or telephone +972 08 282 4776 – 282 5893. Do Not Kill Adham With Your Closure ! !